CORD Leader Raila Odinga yesterday maintained President Uhuru Kenyatta and his Deputy William Ruto must account for the missing Ksh 15 billion as revealed by the Auditor-General. The 15 billion was lost during the period leading to the March 4 elections and thereafter. Most CORD supporters believe Â the money was used by security agencies to buy important electoral players in the last election, including IEBC and the Supreme Court. This is the umpteenth time Raila is calling the Jubilee government to account to the public how the money was used. â€œThey are silent. If they are talking about accountability let them account for that money. That money went to the Office of the President. The officers involved were then quietly moved,â€ he said. CORD believes part of the money is what the Jubilee Alliance is using every weekend to buy political support as the regime has terribly failed to fulfil any of the promises it pledged during campaigns. A lot of money is going in harambees each weekend. â€œThe Nyayo era of harambees is back in full force. You never saw Kibaki conducting harambees everywhere yet we had tangible development projects that were undertaken during our time,â€ Raila said. â€œWhen you have a situation where a Deputy President is engaged in between five and ten harambees in a week and has donated an equivalent of Sh10 million, in a month that is about Sh30 million, yet his salary is known. We also know the businesses he owns. 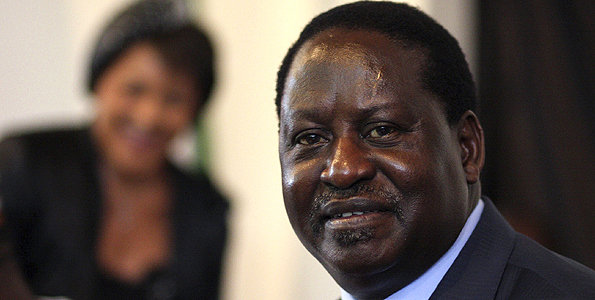 What is this other source of the money?â€ Raila asked. Raila hit out at the jubilee government over its persistent calls to governors to be accountable yet the regime itself is steeped in corruption. Raila said the regime is keen to paint governors as corrupt using audit queries being raised by the Auditor General and which governors are yet to respond to, not final audits. “What these people are talking about is audit queries which have not been responded to. They are using the audit queries to condemn governors.Â They just want to discredit the system they did not believe in from the word go,â€ he said.